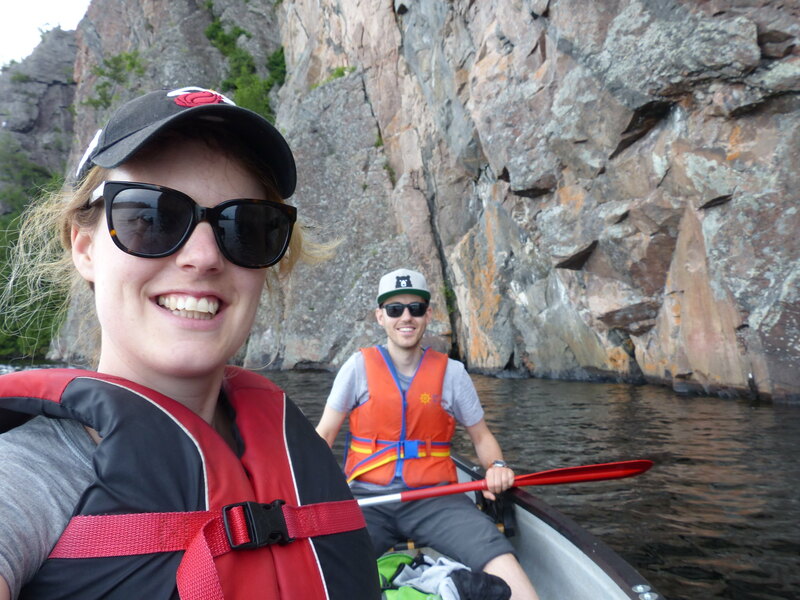 After a couple of fun camping trips last year, we were excited to book a trip to Bon Echo Provincial Park this summer to celebrate Canada Day. 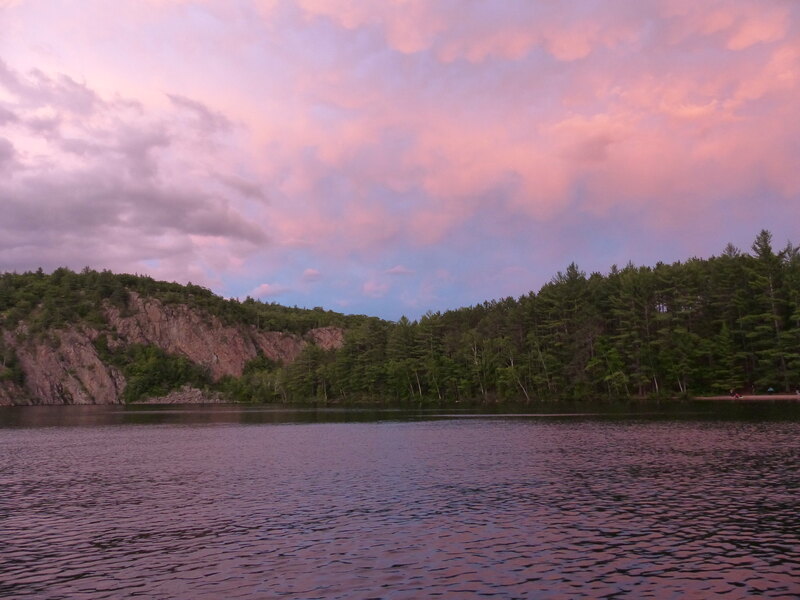 Bon Echo is one of Ontario’s most popular parks, thanks to Mazinaw Rock with its centuries old Aboriginal pictographs and a very large lake to explore. 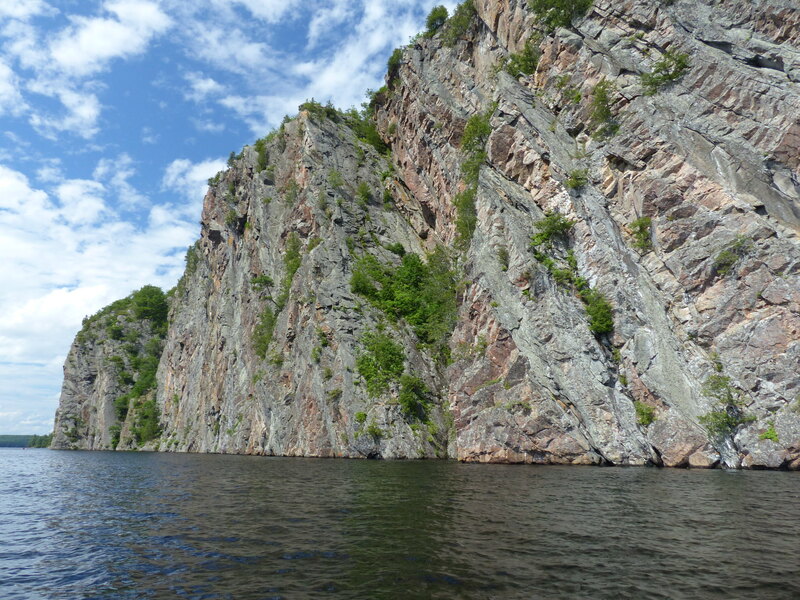 Bon Echo Provincial Park is dominated by the imposing Mazinaw Rock. 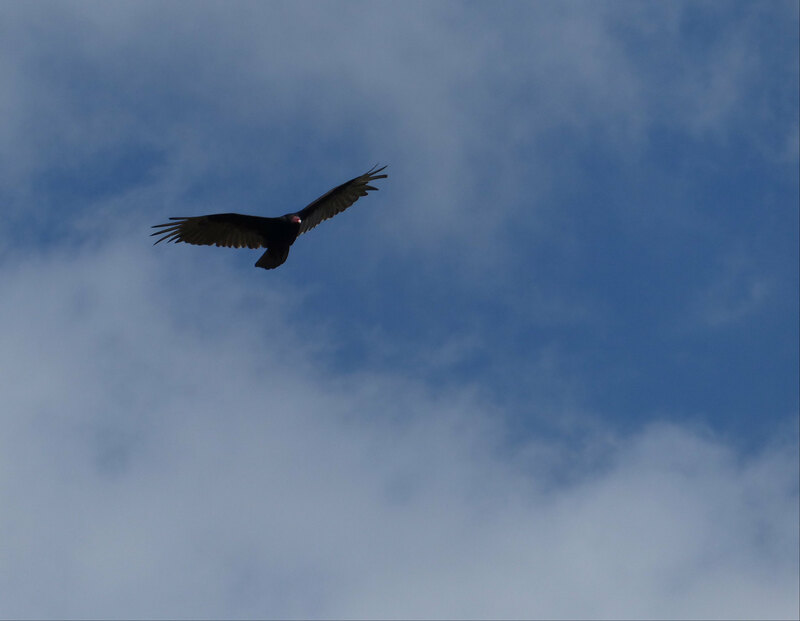 Our long weekend didn’t get off to the best of starts when heavy traffic meant we had to set up our tent in the dark, but we woke up early the next day, excited to explore the park. We headed over to the Bon Echo visitor centre, which, with the gift shop, occupy a couple of old log cabins on the shores of Mazinaw Lake that are the only remnants of a grand resort that once stood in that spot. 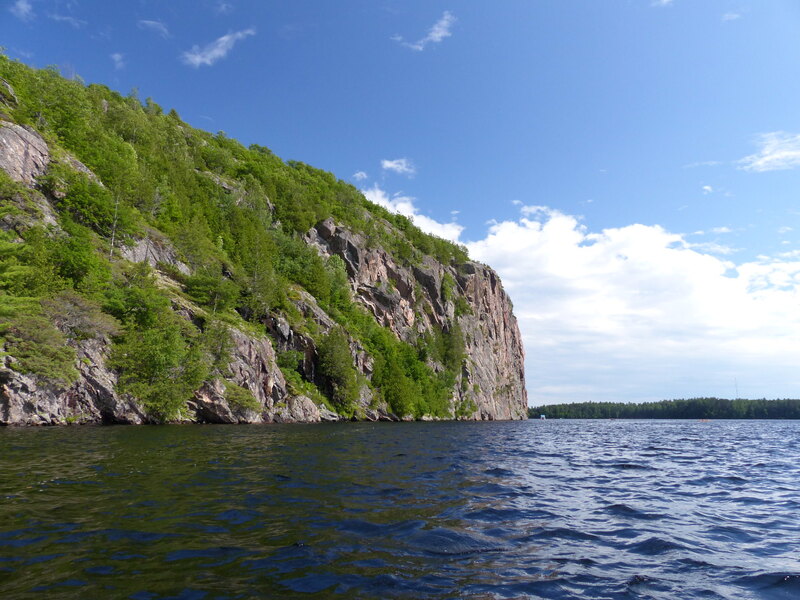 Across the lake, we caught our first glimpse of the massive cliff which is Mazinaw Rock. As lunchtime quickly approached on our first day, we got out everything we needed – plates, some cherry tomatoes, pitta breads (yes, us Brits call them pittas not pitas) and some curried chickpeas. Planning ahead for a hot weekend, we had frozen the curried chickpeas to help keep our perishable food cold inside our cooler box, thinking that they would be defrosted by the time we came to eat them. As it turned out the cooler box was far more effective than we had bargained for, and having eaten the meager amount of chickpeas that had defrosted, and scraped and chipped away at a few more, we decided that chickpea ice cubes weren’t that appetising! 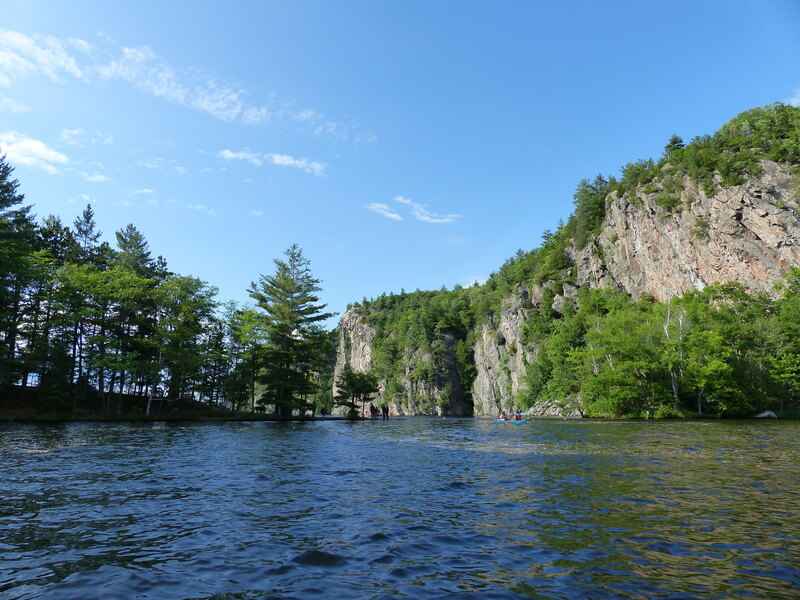 It was now time to explore what Bon Echo is known for, so we headed down to the boat rentals at the lake’s lagoon, and joined a queue with just about everyone else in southern Ontario. Fortunately the queue went surprisingly quickly, and we soon had a canoe. 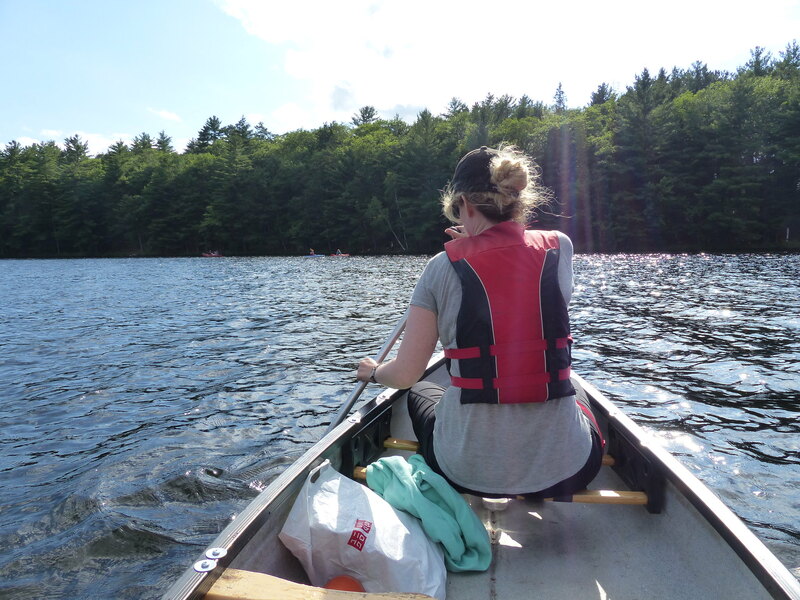 Thanks to our eventful canoe trip last year, this canoeing experience was a breeze (also our $10 water shoes from Canadian Tire were like the greatest investment ever). 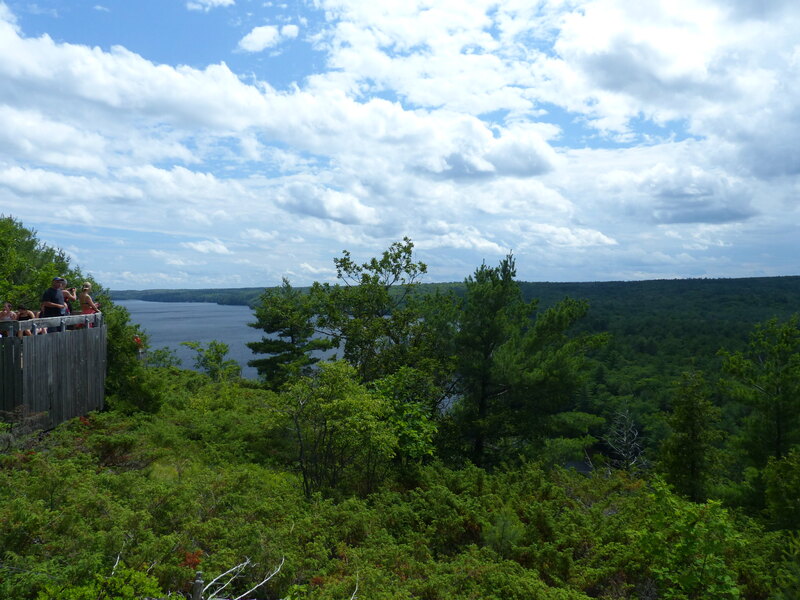 We paddled over to the other side of the lake, which isn’t particularly wide, docked our canoe, then hiked up to the viewing points from the top of the cliffs. On the way up, Emma was proudly carrying her new pink water bottle on its first ever outing. Then, a wasp started bothering her. Emma hates wasps more than a day without chocolate, and so she picked up her pace. The wasp continued to bug her before finally brushing past her water bottle carrying hand. In a panic, she waved her hand up and proceeded to launch her brand new water bottle into the Bon Echo undergrowth. That dealt with the wasp and fortunately, being bright pink in a sea of green, it wasn’t difficult to find the water bottle. Our campsite was somewhere in all those trees! 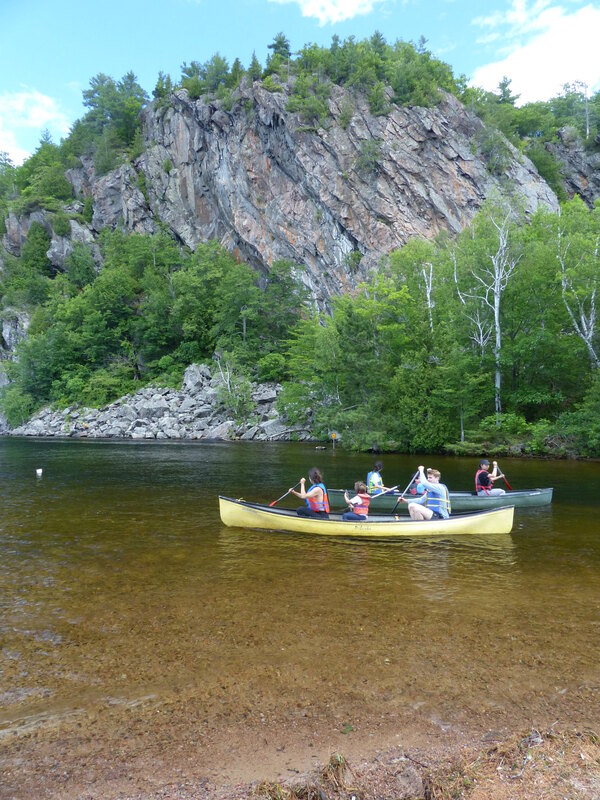 We returned from the top of the cliff to our canoe. Getting ready to head off, a know-it-all lady decided to push in front of us in her kayak. It’s cruel to say, but we were therefore almightily pleased when she promptly capsized the kayak and flashed me a sheepish look as her drenched head emerged from beneath the surface of the lake. 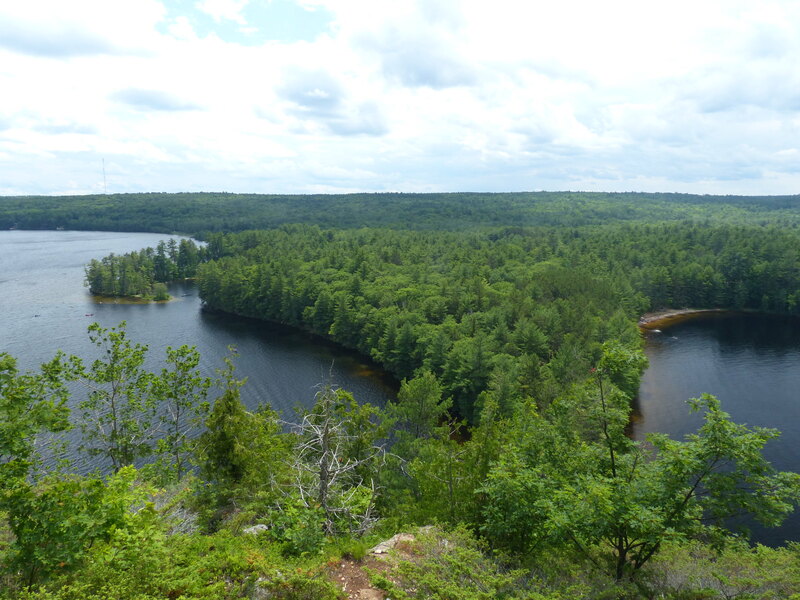 Whilst the view from the top of Mazinaw Rock was good, the view from the water is even better. 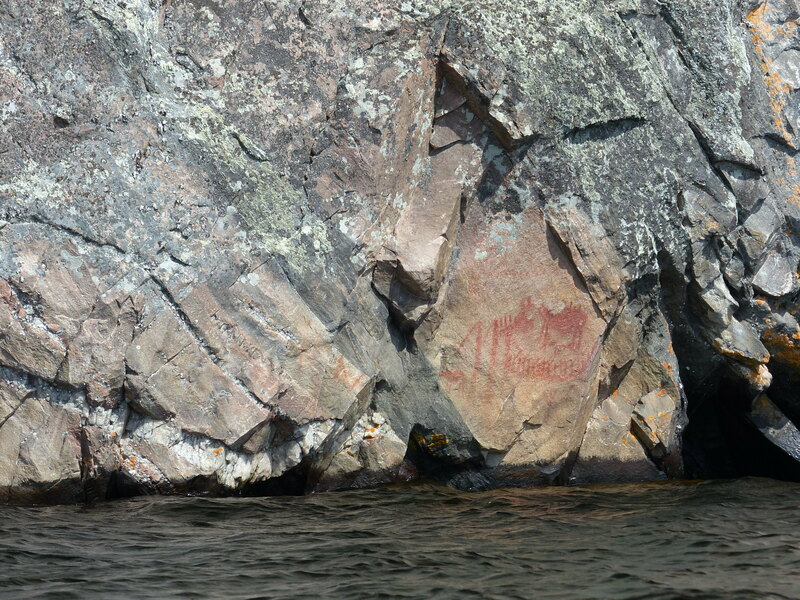 The cliffs rise up 100 metres above the lake and are covered in 263 native pictographs, which are hundreds of years old, with some even painted as far back as 1,000 years ago! 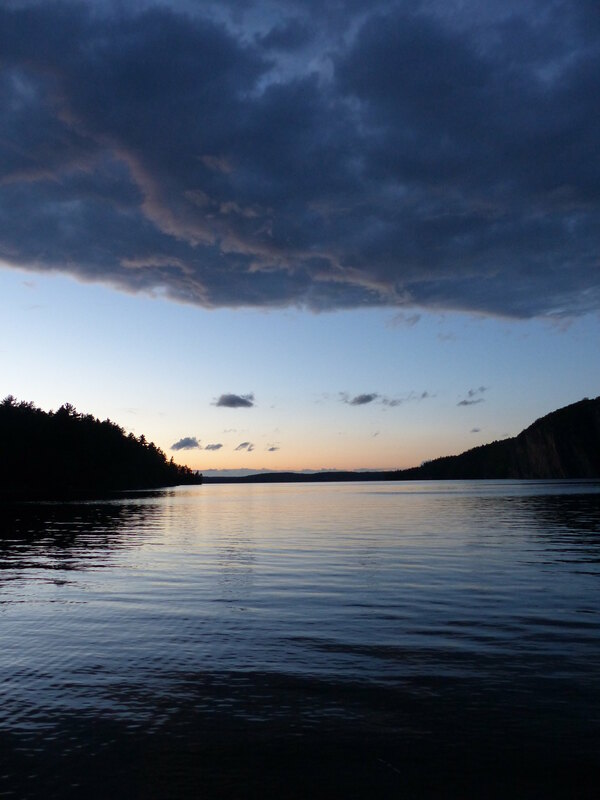 The lake itself is the second deepest in southern Ontario (besides the Great Lakes) at 145 metres – because you know, everything has to be the biggest, deepest, fastest, tallest something somewhere – which is a depth not to think about as you paddle around on the surface. 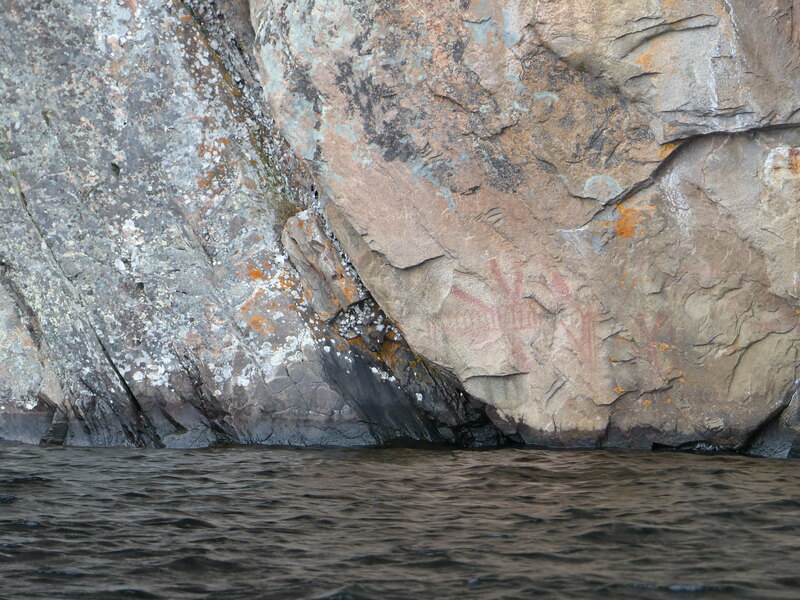 We were starting to think that the pictographs were imaginary though, as we couldn’t spot a single one. 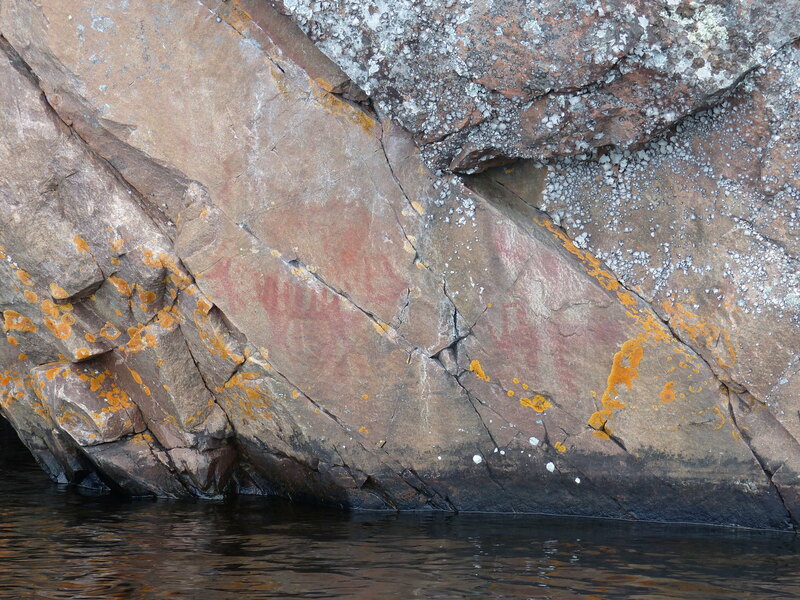 Then finally Emma did locate one and, now knowing what we were looking for, we started spotting pictographs all over the cliffs as we made our way back along them. 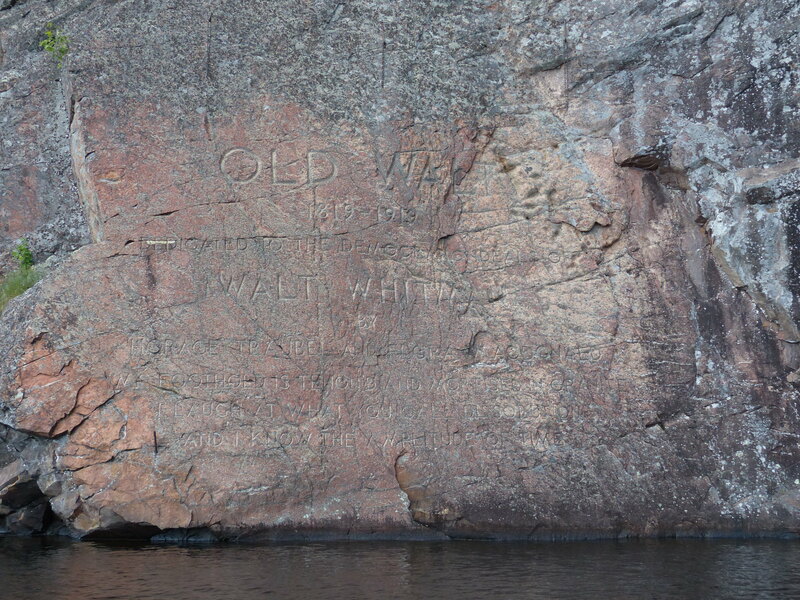 At last we finally spotted our first pictograph on Mazinaw Rock! Happy faces having found lots of pictographs! 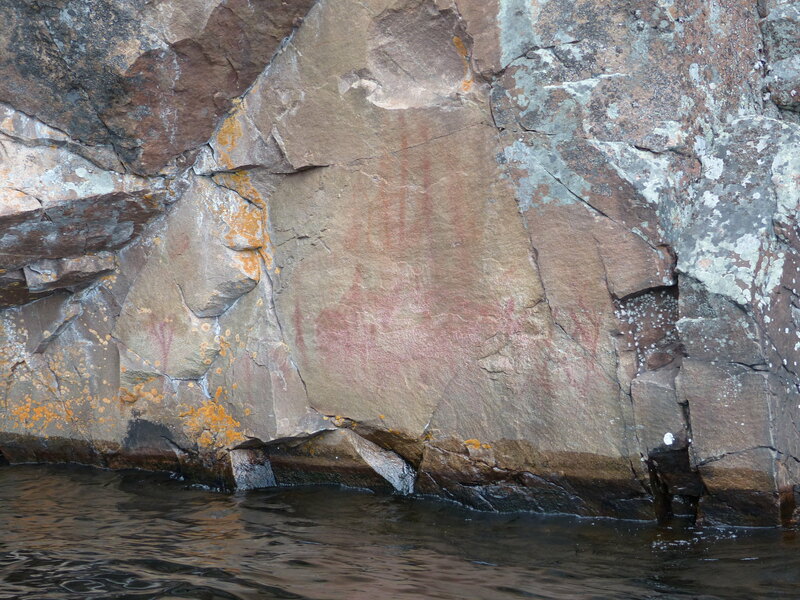 In most cases, you can paddle right up to the pictographs which sit at the water’s edge, and it is cool to think that someone had floated in that same spot so many years ago painting what you see before you. 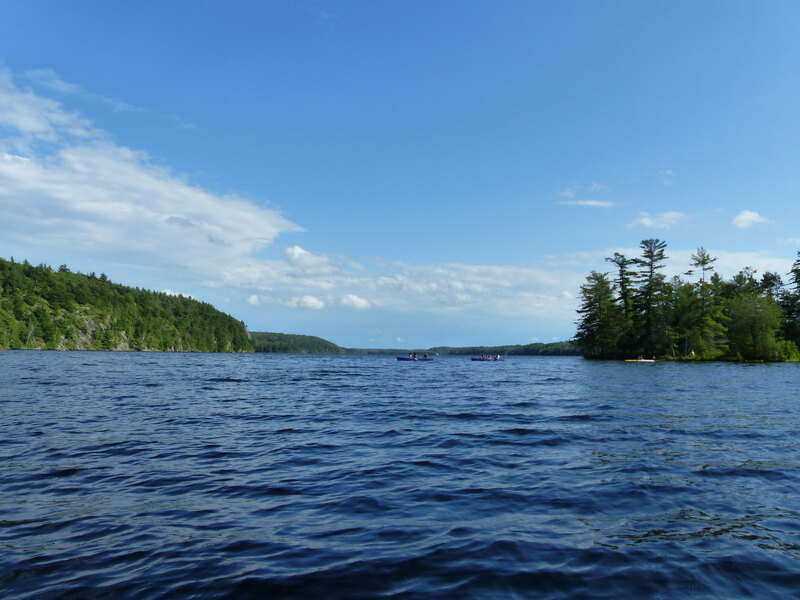 With more gorgeous weather the following day, we returned to the water again, renting a canoe for a couple of hours and exploring the perimeter of Lower Mazinaw Lake. An added bonus was that our chickpeas had now fully defrosted too! 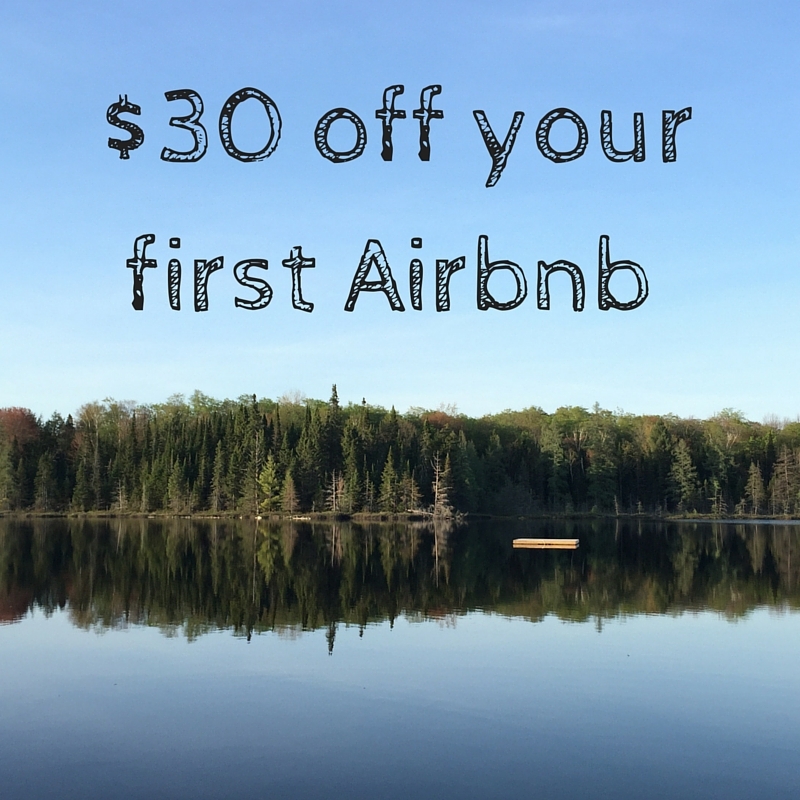 I’m glad you guys enjoyed one of our favourite Provincial Parks. Mazinaw Rock is even more awe-inspiring when you are at the base of it in a canoe or kayak, isn’t it. Pictures don’t give the perspective of just how massive it is! If you ever get a chance, Bon Echo at Thanksgiving is beautiful, with the changing leaves. 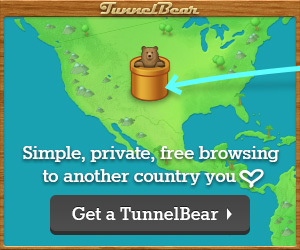 Keep on discovering guys!! Yes your’re right, it’s not until you’re up close in a canoe do you appreciate its size! 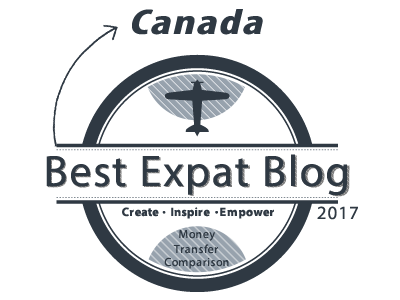 Thanks for the tip about visiting at Thanksgiving – hopefully we can do that next year!